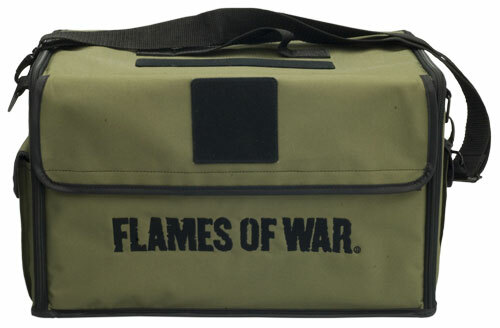 Well for my xmas gift to myself, I shelled out the $100 for a Flames of War case. I play US for flames of war, specifically a tank company, and the start of a paratrooper army. My first impression was WOW! The things is really well made, and is durable. There is a lot of room for models inside of all kinds (infantry, tanks, command teams, artillery, armoured infantry and vehicles, etc). The only issue I have, is that the foam included is generic, so any army can use it. Now for any of the infantry or artillery, basically anything on a base this is no problem, as the bases sizes are standard and fit nice and snugly. The problem is in the tank and vehicle areas. I play with shermans, stuarts, M10s and halftracks, and unfortunately, the US versions of these are smaller than other armies, which leads to lost turrets in general jumbling around if i am rough with the case (as I was on purpose to test it). Now, I am in the process of magnetizing all my turrets so that should solves the problem mostly. And Battlefoam does make army specific trays, which I will likely invest in, in the new year, but for now, the bog standard case is what I have. Final Analysis (or the TL;DR section): The case is very well made and seems ideally suited for German armour. All models on bases will be great in this case. Various factions tanks and armoured vehicles may see a bit of shuffling, though if you don't bang your case around they'll be steller. Quality: 9/10 - Well made, durable, good construction. Appearance: 10/10 - Looks great and with an army specific patch and a nameplate it would DY-NO-MITE! Would I buy one again? Yes I would, but I would immediately shell out the cash for the army specific trays and sell some of the standard ones to friends/ebay. Christmas gifts to yourself are great aren't they? You always get what you want and you never moan about it costing too much. I thought your review was a useful one. I particularly appreciate your pointing out the challenges associated with generic foam sizes. You should give us an update ina few months when the case has had a chance to bed in!